Queen Anne Westerwald saltglaze grey pottery ale jug priced at £3200 from dealer Laurence Cooper at the BBR specialist fair. 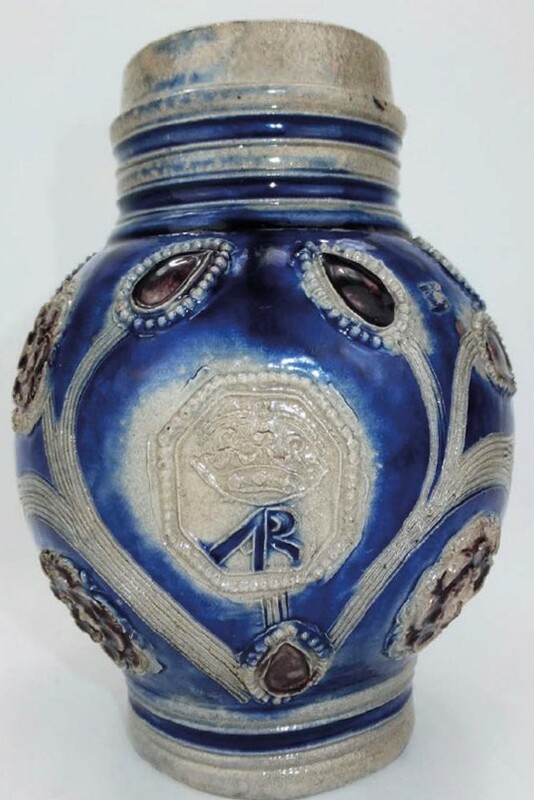 A Queen Anne Westerwald saltglaze grey pottery ale jug with blue painted designs marked AR for Anna Regina is for sale at £3200 from dealer Laurence Cooper of West Sussex, who has dated the item to c.1702-07. He will offer it on his stall at the BBR specialist fair at Elsecar in South Yorkshire on Sunday, April 28. BBR, the antique bottles, potlids and advertising auction business, runs quarterly weekend sales at the Elsecar Heritage Centre near Barnsley. The fair runs alongside the two-day auction, on the Sunday (under an overall title of Spring Extravaganza).